Multiplayer game servers often require lots of compute power and low latency to players. With AWS, you no longer need to guess how many game servers you will need, knowing that they can be set up to scale automatically as your game grows. With a growing list of AWS Regions and Availability Zones, you can be rest assured that your game servers are closest to your players than ever before for a great in-game experience. Whether you choose to roll your own solution on Amazon Elastic Compute Cloud (EC2) or leverage our manager Amazon Gamelift service, AWS provides you with the tools necessary to power your next worldwide launch. Game server workload is a natural fit for running on AWS, due to unexpected traffic patterns and highly demanding request rates. Game engines install on EC2 and create an Amazon Machine Image. You can then easily deploy EC2 instances across multiple regions as you need. With Amazon Auto Scaling, your Amazon EC2 capacity can scale up and down automatically to make sure your players from anywhere in the world can enjoy a seamless gaming experience. 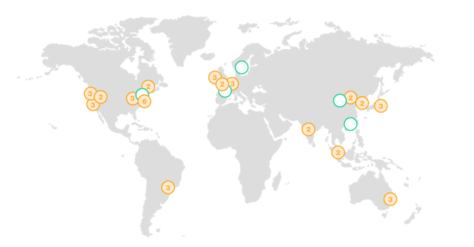 The AWS Cloud infrastructure is built around Regions and Availability Zones (“AZs”). A Region is a physical location in the world where we have multiple Availability Zones. Availability Zones consist of one or more discrete data centers, each with redundant power, networking and connectivity, housed in separate facilities. These Availability Zones offer you the ability to operate production applications and databases which are more highly available, fault tolerant and scalable than would be possible from a single data center. The AWS global infrastructure allows your game servers to be located closest to your players than ever before for a great in-game experience. Amazon EC2 provides secure, resizable compute capacity in the cloud. It allows you to obtain and configure capacity with minimal friction. This whitepaper discusses the exciting usecase of running multiplayer game servers in the AWS Cloud and the optimizationsthat you can make to achieve the highest level of performance. In this whitepaper, we provide you the information you need to take advantage of the Amazon Elastic Compute Cloud (EC2) family of instances to get the peak performance required to successfully run a multiplayer game server on Linux in AWS. This blog post will dive into the player-matching patterns and focus on a matchmaking architecture that uses a custom algorithm to group players and connect them with a server. It will also provide code examples so you can build your own custom matchmaking architecture. This is a deep-dive straight into the guts of running a low-latency multiplayer game, such as a first-person shooter, on a global scale. We dive into architectures that enable you to split apart your back-end APIs from your game servers, and Auto Scale them independently. Many of the most popular AAA multiplayer games run on AWS. Start your AWS Cloud journey today and take game development to next level.